Bone marrow and offal in general have had some tricky years this century. Mad Cow Disease didn't help (and we shouldn't forget that beef bones were banned in the UK for some time), but I suppose it all started after the war, when people started to be able to afford to eat more meat. They stopped buying and enjoying cheaper cuts and innards which subsequently fell out of vogue, as did British cooking in general, especially in the restaurant scene. Fergus Henderson of St. John is largely credited (and I believe rightly so) with the renewed respect for British cooking, and for offal in particular. I'm still not a real convert, so I'm not going to pretend that every time I go to St. John I have the bone marrow, or liver or tripe or any such thing. Most often I have equally delicious but less "adventurous" options. It actually took me a year of almost weekly visits to try the bone marrow, but I advise you to do as I say, not as I do. The jelly-ish interior of the veal bones has a deeply savoury flavour perfectly complemented in taste and texture by the crispy toast and fresh parsley salad. If you can't get yourself to Smithfield (or St. John Bread and Wine in Spitalfields) then check out the recipe - brought to you by one minimalist from another. Æbleskiver (n., pl. )- Doesn't this word sound like something you might call a truant child, skiving off of school? Well it's not. Æbleskiver are spherical Danish pancakes. In English the word is most often written ebleskiver or aebleskiver according to my (mostly) trusty source Wikipedia. 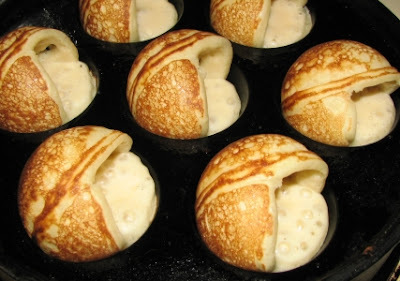 I'm off to search for an aebleskiver pan online. 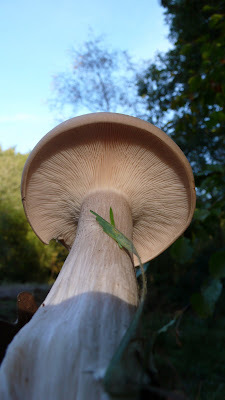 We drove out to Berkshire a couple of weeks ago for a mushroom-foraging folly. 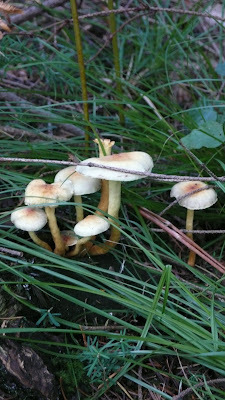 I had always wanted to eat mushrooms I had picked myself and I daydreamed of lightly browned, soft fungi dripping garlicky butter into a dark piece of toast. 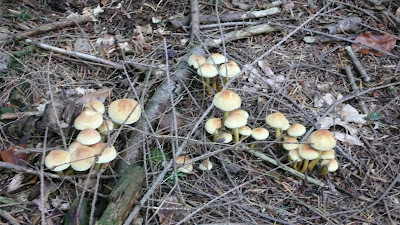 I still dream about it, because despite all of the mushrooms we saw that day we didn't eat any and only picked a couple to examine them. 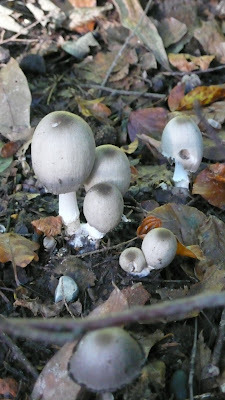 I could not, and still cannot tell you what they are. What I did discover that day is that my fear of death (or at least severe illness) wins out over my greatest gastronomic desires.